This is a list of ancient dishes, foods and beverages that have been recorded as originating during ancient history. The span of recorded history is roughly 5,000 years, beginning with Sumerian Cuneiform script, the oldest discovered form of coherent writing from the protoliterate period around the 30th century BC. Although the end date of ancient history is disputed, some Western scholars use the fall of the Western Roman Empire in 476 AD (the most used), the closure of the Platonic Academy in 529 AD, the death of the emperor Justinian I in 565 AD, the birth of Islam in 610 CE or the rise of Charlemagne as the end of ancient and Classical European history. This list does not contain entries that originated after ancient history. Anfu ham is a dry-cured ham from Anfu, Jiangxi, China that originated from the Qin Dynasty. It is eaten alone and also used as an ingredient to add flavor to various dishes. Babaofan or Eight Treasure Glutinous Rice was first created for a banquet celebrating King Wu of Zhou's defeat of the last King of the Shang Dynasty King Zhou of Shang in the Battle of Muye (circa 1123 BCE according to this article but 1046 BCE according to English Wikipedia article). Chili pepper (hot peppers) – remains of wild peppers were found in the Tehuacan Valley, 250 kilometres (160 mi) south of Mexico City, Mexico that date back to 7,000 BC. The peppers were found in fossilized human coprolites (fossilized human feces). Rice – existed, but was "little-used in the ancient world" outside of Asia. Beer is recorded in the written history of Mesopotamia and ancient Egypt and is one of the world's oldest prepared beverages. Kombucha originated in what is now Manchuria around 220 BCE, and is said to have been imported to Japan around 400 CE by the physician Kombu. Wine consumption and production has been found through archaeological evidence as early as c. 6000 BC. Millet – a staple food of ancient China, Egypt and India; Staple in Northern China before rice. Maize - originated in Central America between 5600 and 4000 BCE. Rice - originated in Southern China 8,200 - 13,500 years ago. Teff - a native grain to Ethiopia and Eritrea that happened to be domesticated sometime between 8000 and 5000 BC. Brânză– an ancient Romanian cheese dating to "before the time of the Romans"
Hummus first mentioned in a cookbook from Cairo, Egypt from the 13th century. Kuluban – an ancient Javanese dish of boiled vegetables served in spices, similar with today urap. Mentioned in The Rukam inscription dated 829 Saka (907 CE) from Mataram kingdom ancient Java, Indonesia. Lalab – vegetable dish called as rumwah-rumwah in ancient Java, Indonesia. Mentioned in The Panggumulan (Kembang Arum) inscription dated 824 Saka (902 CE) from Mataram kingdom. Rawon – meat stew, mentioned as rarawwan in ancient Javanese Taji inscription (901 CE). Rujak – spicy fruit dish, mentioned as rurujak in ancient Javanese Taji inscription (901 CE). Krupuk – traditional cracker made from rice flour, mentioned as kurupuk in ancient Javanese Taji inscription (901 CE). Tempeh - high protein fermented soy product from Indonesia. First known as kadêlê mentioned in an old Javanese manuscript Serat Sri Tanjung from the 12th to 13th century CE. Nattō is prepared using fermented soybeans, and has been described as likely being an ancient food. Its origins have been described as unknown. Nattō may have been developed independently in different areas that have the same ingredients, such as Japan, China and Korea. Nattō is typically consumed atop rice. ^ "The origin of sausage goes back to ancient times." 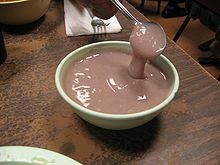 ^ "An ancient food, soup is prepared by cooking meat, fish or vegetables and the like in such fluids as water or milk; it is then consumed as a liquid." ^ "Smy, or thickened milk, both human and animal, is often mentioned in medical prescriptions." 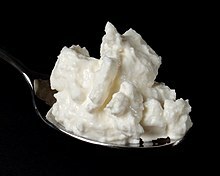 ^ "Cheese is represented in the tomb art of ancient Egypt and in Greek literature"
^ "In the Pacific Islands, poi, made from taro root, is an ancient food that is preserved through fermentation." ^ "Chickpea is an ancient food crop in the Highlands, but whether it was domesticated indigenously is debatable. Ethiopian varieties are infertile when crossed with Near Eastern varieties. This genetic incompatibility may reflect distinct ecological ..."
^ "ancient history". Collins English Dictionary. Retrieved 19 May 2016. ^ "ancient history". Oxford English Dictionary. Retrieved 19 May 2016. ^ Raymond, T.; Brew, H.S. (2014). Seventh Grade Social Science: For Homeschool or Extra Practice. Golgotha Press. p. pt38. ISBN 978-1-62917-337-5. Retrieved May 19, 2016. ^ Harmon, J. (2013). AP World History Crash Course. Research & Education Association. p. 262. ISBN 978-0-7386-6964-9. Retrieved May 19, 2016. ^ Colish, M.L. (1990). The Stoic Tradition from Antiquity to the Early Middle Ages: Stoicism in Christian Latin Thought Through the Sixth Century. Studies in the history of Christian thought. BRILL. p. 353. ISBN 978-90-04-09330-0. Retrieved May 19, 2016. ^ Bedell, J.M. (2015). So, You Want to Work with the Ancient and Recent Dead? : Unearthing Careers from Paleontology to Forensic Science. Be What You Want. Aladdin/Beyond Words. p. pt22. ISBN 978-1-4814-3846-9. Retrieved May 19, 2016. ^ a b Sterling, D. (2014). Yucatรกn: Recipes from a Culinary Expedition. The William and Bettye Nowlin Series in Art, History, and Culture of the Western Hemisphere. University of Texas Press. p. 280. ISBN 978-0-292-73581-1. Retrieved May 20, 2016. ^ a b Isacs, John H. (January 16, 2014). "How to match dry-cured swine with perfect wine". Shanghai Daily. Retrieved 21 May 2017. ^ Flux, P. (2001). Ancient Egypt. Explore history. Pearson Education. p. 12. ISBN 978-0-435-33854-1. Retrieved May 19, 2016. ^ Kaufman, C.K. (2006). Cooking in Ancient Civilizations. Daily Life Through History. Greenwood Press. p. 87. ISBN 978-0-313-33204-3. Retrieved May 19, 2016. ^ Nicholson, P.T. ; Shaw, I. (2000). Ancient Egyptian Materials and Technology. Cambridge University Press. p. 564. ISBN 978-0-521-45257-1. Retrieved May 19, 2016. ^ Kraig, B.; Sen, C.T. (2013). Street Food Around the World: An Encyclopedia of Food and Culture. ABC-CLIO. p. 207. ISBN 978-1-59884-955-4. Retrieved May 19, 2016. ^ Griffith, J.B. (2013). Knead It! : 35 Great Bread Recipes to Make at Home Today. i-5 Publishing LLC. p. 100. ISBN 978-1-62008-054-2. Retrieved May 19, 2016. ^ Raichlen, S.; Fink, B. (2008). The Barbecue! Bible. Workman Pub. p. 128. ISBN 978-0-7611-4944-6. Retrieved May 19, 2016. ^ Aggarwal, U. (2016). 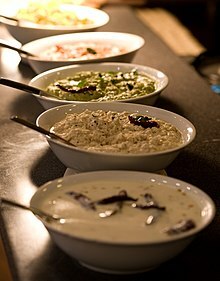 Incredible Taste of Indian Vegetarian Cuisine. First Edition. Allied Publishers Pvt. Limited. p. 200. ISBN 978-93-85926-02-0. Retrieved May 19, 2016. ^ Huang, H.T. (2000). Fermentations and Food Science. Biology and biological technology. Cambridge University Press. p. 88. ISBN 978-0-521-65270-4. Retrieved May 19, 2016. ^ DeWitt, D. (2014). Precious Cargo: How Foods From the Americas Changed The World. Counterpoint LLC. p. 281. ISBN 978-1-61902-388-8. Retrieved May 19, 2016. ^ Dalby, A. (2013). Food in the Ancient World from A to Z. The Ancient World from A to Z. Taylor & Francis. p. 156. ISBN 978-1-135-95422-2. Retrieved May 19, 2016. ^ V. M. Balasubramaniam, G.V.B.C.H.L.M.L. (2016). High Pressure Processing of Food. Food Engineering Series. Springer. p. 598. ISBN 978-1-4939-3234-4. Retrieved May 19, 2016. ^ Dalby, A. (2013). Food in the Ancient World from A to Z. The Ancient World from A to Z. Taylor & Francis. p. 269. ISBN 978-1-135-95422-2. Retrieved May 19, 2016. ^ Hui, Y.H. ; Meunier-Goddik, L.; Josephsen, J.; Nip, W.K. ; Stanfield, P.S. (2004). Handbook of Food and Beverage Fermentation Technology. Food Science and Technology (Marcel Dekker), Vol 134. Taylor & Francis. p. 427. ISBN 978-0-8247-5122-7. Retrieved May 19, 2016. ^ Helstosky, Carol (2009). Food Culture in the Mediterranean. Greenwood Publishing Group. p. 7. ISBN 978-0313346262. ^ Kiple, K.F. (2000). The Cambridge world history of food. 2 (2000). The Cambridge world history of food. Cambridge University Press. p. 1186. ISBN 978-0-521-40215-6. Retrieved May 19, 2016. ^ Dalby, A. (2013). Food in the Ancient World from A to Z. The Ancient World from A to Z. Taylor & Francis. p. 222. ISBN 978-1-135-95422-2. Retrieved May 19, 2016. ^ Leslie Bilderback, CMB (2007). The Complete Idiot's Guide To Comfort Food. THE COMPLETE IDIOT'S GUIDE. DK Publishing. p. 167. ISBN 978-1-4406-2617-3. Retrieved May 19, 2016. ^ Waxman, M.B. (2008). Eat Me Now! : Healthy Macrobiotic Cooking for Students and Busy People. PublishAmerica. p. pt150. ISBN 978-1-4560-4528-9. Retrieved May 19, 2016. ^ Coyle, L. Patrick (1982). The world encyclopedia of food. Facts on File. p. 427. ISBN 9780871964175. Retrieved 20 May 2016. ^ Whitehouse, R. (2016). Liguria. Bradt Travel Guides Liguria. Bradt Travel Guides. p. 34. ISBN 978-1-78477-010-5. Retrieved May 19, 2016. ^ Harper, D.; Faccioli, P. (2010). The Italian Way: Food and Social Life. University of Chicago Press. p. 153. ISBN 978-0-226-31726-7. Retrieved May 20, 2016. ^ a b c d e f g h i j Kurmann, Joseph A.; Rasic, J.L. ; Kroger, M. (1992). Encyclopedia of Fermented Fresh Milk Products: An International Inventory of Fermented Milk, Cream, Buttermilk, Whey, and Related Products. An Avi book. Springer. p. 352. ISBN 978-0-442-00869-7. Retrieved May 19, 2016. ^ Dalby, A. (2003). Food in the Ancient World from A to Z. Ancient world from A to Z. Routledge. p. 218. ISBN 978-0-415-23259-3. Retrieved May 19, 2016. ^ "American Pie". American Heritage. April–May 2006. Archived from the original on 2009-07-12. Retrieved 2009-07-04. The Romans refined the recipe, developing a delicacy known as placenta, a sheet of fine flour topped with cheese and honey and flavored with bay leaves. ^ Faas, Patrick (2005). Around the Roman Table. University of Chicago Press. pp. 184–185. ISBN 978-0226233475. ^ Proctor, H.B. (1882). Rice: its history, culture, manufacture, and food value. William Dunham. p. 9. Retrieved May 19, 2016. ^ Alcock, J.P. (2006). Food in the Ancient World. Food through history. Greenwood Press. pp. 34–35. ISBN 978-0-313-33003-2. Retrieved May 19, 2016. ^ Snyder, M.; Faass, N. (2009). The Everything Raw Food Recipe Book. EverythingÂ®. F+W Media. p. 295. ISBN 978-1-4405-2102-7. Retrieved May 19, 2016. ^ "History of the Dry Sausage Business". Volume 61. The National Provisioner. November 29, 1919. p. 19. Retrieved 18 May 2016. ^ America, United Master Butchers of (1915). American Meat Trade and Retail Butchers Journal. Wm. H. Hornidge. p. 217. Retrieved May 19, 2016. ^ Jenkins, N.H. (2007). Cucina del Sole: A Celebration of Southern Italian Cooking. HarperCollins. p. 16. ISBN 978-0-06-072343-9. Retrieved May 19, 2016. ^ Riley, G. (2007). The Oxford Companion to Italian Food. Oxford Companion To... Series. Oxford University Press, USA. p. 327. ISBN 978-0-19-860617-8. Retrieved May 19, 2016. ^ a b Schwartz, A. (1994). Soup Suppers: More Than 100 Main-Course Soups and 40 Accompaniments. HarperCollins. p. 12. ISBN 978-0-06-096948-6. Retrieved May 18, 2016. ^ Coyle, L.P. (1982). The world encyclopedia of food. Facts on File. ISBN 978-0-87196-417-5. Retrieved May 19, 2016. ^ Nasello, Sarah (January 10, 2015). "Try Acquacotta soup as a new recipe for the new year". The Jamestown Sun. Retrieved April 29, 2016. ^ Flacelière, Robert (1965). Daily Life in Greece at the Time of Pericles. Macmillan. p. 170. ^ Dunster, Edward Swift; Foster, Frank Pierce; Hunter, James Bradbridge; Sajous, Charles Eucharist de Medicis; Klaunberg, Henry J.; Stragnell, Gregory; Martí-Ibáñez, Félix (1 January 1917). "International Record of Medicine and General Practice Clinics". MD Publications – via Google Books. ^ Shurtleff, William; Aoyagi, Akiko. History of Soy Sauce (160 CE to 2012):Extensively Annotated Bibliography and Sourcebook (PDF). p. 6. ^ Planet, L.; Staff, Lonely Planet Publications (2012). The World's Best Street Food: Where to Find It and How to Make It. Lonely Planet Publications. p. 165. ISBN 978-1-74321-664-4. Retrieved May 19, 2016. ^ White, A.; Varney, J. (2012). Philadelphia Chef's Table: Extraordinary Recipes from the City of Brotherly Love. Chef's Table. Lyons Press. p. 94. ISBN 978-0-7627-8944-3. ^ Nguyen, A.; Caruso, M. (2012). Asian Tofu: Discover the Best, Make Your Own, and Cook It at Home. Ten Speed Press. p. 1. ISBN 978-1-60774-025-4. Retrieved May 19, 2016. ^ "Backgrounder:Origins of Zongzi". Sina 新浪 English. ^ Davidson, A.; Vannithone, S.; Jaine, T. (2014). The Oxford Companion to Food. Oxford Companions Series. Oxford University Press. p. 760. ISBN 978-0-19-967733-7. Retrieved May 19, 2016. ^ "Earliest Known Winery Found in Armenian Cave". news.nationalgeographic.com. Retrieved 2015-11-01. ^ a b c Pittman, A.T. (2016). Everyday Whole Grains: 175 New Recipes from Amaranth to Wild Rice, Including Every Ancient Grain. Time Incorporated Books. p. 20. ISBN 978-0-8487-4744-2. Retrieved May 19, 2016. ^ a b Innovation, N.R.C.A.C.T. (1984). Amaranth: Modern Prospects for an Ancient Crop. BOSTID Reports. National Academy Press. p. 29. ISBN 978-0-87857-560-2. Retrieved May 20, 2016. ^ a b Wilson, N. (2013). Encyclopedia of Ancient Greece. Taylor & Francis. p. 27. ISBN 978-1-136-78799-7. Retrieved May 20, 2016. ^ a b Huang, H.T. (2000). Fermentations and Food Science. Biology and biological technology. Cambridge University Press. p. 29. ISBN 978-0-521-65270-4. Retrieved May 20, 2016. ^ a b c d e Diamond, M. (2009). The American Vegetarian Cookbook from the Fit for Life Kitchen. Grand Central Publishing. p. 38. ISBN 978-0-446-57102-9. Retrieved May 20, 2016. ^ Piperno, Dolores R. (2011). "The Origins of Plant Cultivation and Domestication in the New World Tropics". Current Anthropology. 52 (S4): S453–S470. doi:10.1086/659998. ISSN 0011-3204. ^ MacDonald, N. (2008). What Did the Ancient Israelites Eat? : Diet in Biblical Times. Eerdmans Publishing Company. p. 20. ISBN 978-0-8028-6298-3. Retrieved May 19, 2016. ^ a b Ermatinger, J.W. (2015). The World of Ancient Rome: A Daily Life Encyclopedia [2 volumes]: A Daily Life Encyclopedia. Daily Life. ABC-CLIO. p. 307. ISBN 978-1-4408-2908-6. Retrieved May 19, 2016. ^ Alan Davidson (2014). Tom Jaine (ed.). The Oxford Companion to Food (3rd ed.). Oxford: Oxford University Press. p. 812. ISBN 978-0-19-967733-7. ^ Arnow, L.E. (1972). Food Power: A Doctor's Guide to Commonsense Nutrition. G - Reference, Information and Interdisciplinary Subjects Series. Nelson-Hall Company. p. 237. ISBN 978-0-911012-37-8. Retrieved May 19, 2016. ^ Wiley, A.S. (2014). Cultures of Milk. Harvard University Press. p. 25. ISBN 978-0-674-72905-6. Retrieved May 19, 2016. ^ a b Thurmond, D.L. (2006). A Handbook of Food Processing in Classical Rome: For Her Bounty No Winter. Technology and change in history. Brill. p. 193. ISBN 978-90-04-15236-6. Retrieved May 19, 2016. ^ Drysdale, J.J.; Hughes, R.; Dudgeon, R.E. ; Russell, J.R. (1884). The British Journal of Homoeopathy. Maclachlan, Stewart, & Company. p. 244. Retrieved May 19, 2016. ^ Darby, W.J. ; Ghalioungui, P.; Grivetti, L. (1977). Food: The Gift of Osiris. Food: The Gift of Osiris. Academic Press. p. 775. ISBN 978-0-12-203402-2. Retrieved May 19, 2016. ^ Rule, C.S. (2015). Yogurt Culture: A Global Look at How to Make, Bake, Sip, and Chill the World's Creamiest, Healthiest Food. Houghton Mifflin Harcourt. p. 353. ISBN 978-0-544-25171-7. Retrieved May 19, 2016. ^ Fox, P.F. (2004). Cheese: General aspects. Cheese: Chemistry, Physics and Microbiology. General Aspects. Elsevier. p. 2. ISBN 978-0-12-263652-3. Retrieved May 19, 2016. ^ Hayes, Dayle; Laudan, R. (2009). Food and Nutrition/Editorial Advisers, Dayle Hayes, Rachel Laudan. Food and Nutrition. Marshall Cavendish Reference. p. 197. ISBN 978-0-7614-7821-8. Retrieved May 19, 2016. ^ Ehlers, S.; Hurt, J. (2008). The Complete Idiot's Guide to Cheeses of the World. Complete Idiot's Guide to. Alpha Books. p. 117. ISBN 978-1-59257-714-9. Retrieved May 19, 2016. ^ Ehlers, S.; Hurt, J. (2008). The Complete Idiot's Guide to Cheeses of the World. Complete Idiot's Guide to. Alpha Books. p. 55. ISBN 978-1-59257-714-9. Retrieved 2016-05-19. ^ Michelson, P.; Linder, L. (2010). Cheese: Exploring Taste and Tradition. Gibbs Smith. p. 114. ISBN 978-1-4236-0651-2. Retrieved May 19, 2016. ^ Robinson, R.K.; Tamime, A.Y. (1996). Feta & Related Cheeses. Ellis Horwood Series in Food Science and Technology. Taylor & Francis. p. 49. ISBN 978-0-7476-0077-0. Retrieved May 19, 2016. ^ Fox, P.F. (2012). Cheese: Chemistry, Physics and Microbiology: Volume 2 Major Cheese Groups. Springer US. p. 526. ISBN 978-1-4615-2648-3. Retrieved May 19, 2016. ^ Ehlers, S.; Hurt, J. (2008). The Complete Idiot's Guide to Cheeses of the World. Complete Idiot's Guide to. Alpha Books. p. 123. ISBN 978-1-59257-714-9. Retrieved May 19, 2016. ^ Donnelly, C.W. (2014). Cheese and Microbes. ASM Press. p. 160. ISBN 978-1-55581-859-3. Retrieved May 19, 2016. ^ Lawrence, L.; Lawrence, L.P. (2008). Cooking for My Family: From Catherine Pasculli's Hoboken Kitchen. iUniverse. p. 325. ISBN 978-0-595-48282-5. Retrieved May 19, 2016. ^ Magazine, C.; Miller, L.; Skinner, T.; Tsai, M. (2012). Cheese For Dummies (in Spanish). Wiley. p. 177. ISBN 978-1-118-14552-4. Retrieved May 19, 2016. ^ Harbutt, J. (2009). World Cheese Book. DK Publishing. p. 127. ISBN 978-0-7566-6218-9. Retrieved May 19, 2016. ^ Barham, E.; Sylvander, B. (2011). Labels of Origin for Food: Local Development, Global Recognition. CABI. p. 177. ISBN 978-1-84593-377-7. Retrieved May 19, 2016. ^ Kurlansky, M. (2011). Salt: A World History. Knopf Canada. p. 154. ISBN 978-0-307-36979-6. Retrieved May 19, 2016. ^ Ehlers, S.; Hurt, J. (2008). The Complete Idiot's Guide to Cheeses of the World. Complete Idiot's Guide to. Alpha Books. p. 46. ISBN 978-1-59257-714-9. Retrieved May 19, 2016. ^ Kessler, B. (2009). Goat Song: A Seasonal Life, A Short History of Herding, and the Art of Making Cheese. Scribner. p. 211. ISBN 978-1-4165-6099-9. Retrieved May 19, 2016. ^ Harbutt, J. (1999). Cheese. Game & Fish Mastery Library. Willow Creek Press. p. 103. ISBN 978-1-57223-200-6. Retrieved May 19, 2016. ^ Plant Genetic Resources Newsletter. Bioversity International. p. 25. Retrieved May 20, 2016. ^ Cumo, C. (2015). Foods that Changed History: How Foods Shaped Civilization from the Ancient World to the Present: How Foods Shaped Civilization from the Ancient World to the Present. ABC-CLIO. p. 358. ISBN 978-1-4408-3537-7. Retrieved May 19, 2016. ^ Bureau, C.R. (2006). The CRB Commodity Yearbook 2006. CRB Commodity Year Book. Wiley. p. 248. ISBN 978-0-470-08394-9. Retrieved May 20, 2016. ^ Smith, B.E. ; Plotkin, P. (2014). Idiot's Guides: The Chia Seed Diet. Idiot's guides. DK Publishing. p. pt21. ISBN 978-1-61564-531-2. Retrieved May 20, 2016. ^ Marcoux, P. (2014). Cooking with Fire. Storey Publishing LLC. p. 105. ISBN 978-1-61212-158-1. Retrieved May 18, 2016. ^ Davidson, Alan (2014). The Oxford Companion to Food. Oxford University Press. p. 95. ISBN 978-0-19-967733-7. ^ Yudi Anugrah Nugroho (18 December 2013). "Cita Rasa Kuliner Nusantara". Historia (in Indonesian). ^ a b c "Menguak Fakta Menu Lalapan Sunda Lewat Prasasti Taji". beritasatu.com (in Indonesian). Retrieved 2017-12-23. ^ Donoso, M.C. (2009). Water Interactions with Energy, Environment, Food and Agriculture Volume I. p. 66. ISBN 978-1-84826-172-3. Retrieved May 20, 2016. ^ a b Bessinger, J.; Yablon-Brenner, T. (2009). Simple Food for Busy Families: The Whole Life Nutrition Approach. Celestial Arts. p. 80. ISBN 978-1-58761-335-7. Retrieved May 20, 2016. ^ a b c D, J.D.P. ; Murakhver, N. (2012). They Eat That? : A Cultural Encyclopedia of Weird and Exotic Food from Around the World. ABC-CLIO. p. 141. ISBN 978-0-313-38058-7. Retrieved May 20, 2016.